Hyundai Mobis has announced that it has developed a world-class car suspension technology called eARS for better cornering and ride comfort. The technology integrates all chassis functions and thu improve the safety of automotive driving systems as it raises control precision. The acronym eARS stands for (electrical Active Roll Stabilization), an electronic controlled suspension component that can significantly stabilize the horizontal inclination of the body of a running vehicle by offsetting the leaning of the body that is caused by the centrifugal force created when a vehicle turns quickly and the impact from irregular surfaces. The eARS technology can replace the stabilizer bar which is conventionally used. The stabilizer bar can compromise the comfort of the ride. eARS was developed by Hyundai Mobis over the past five years, and has the capability to deliver world-class performance. It can increasing body stabilization performance by 40 per cent and reduce the size of the system by 5 per cent when compared to the specifications of global competitors. The eARS technology is particularly suitable for the vehicles of the future as it is based on 12V and 48V, making it suitable for green vehicles. 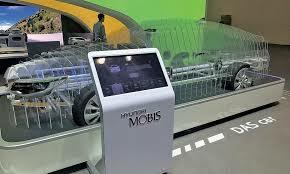 Hyundai Mobis is the only automotive supplier in Korea which has developed eARS based on both 12V and 48V. Hyundai Mobis’ eARS replaces traditional hydraulic control methods with next generation electric motor control method and this technology is currently produced by only a few automotive suppliers from Europe and Japan. Earlier, it was available only in limited premium models due to its high price. Hyundai Mobis is currently engaged in the development of an economical variant of eARS that will have only core features for this technology and is anticipated to have almost limitless demand. By developing eARS, Hyundai Mobis has been able to secure its own electrification technology in chassis, following ones in braking and steering. The company has been working on researching developing electrification technology instead of traditional hydraulic technology for the past 15 years and the new technology is the culmination of this effort. Last year, Hyundai Mobis had supplied high performance electric steering systems, which surpassed the performance of European ones, to premium models. It had also recently applied the integrated electric regenerative braking system that it developed for the second time in the world to FCEVs, thus becoming the first automotive supplier in the world to apply the technology to green vehicles. The automotive supplier also started to mass-produce 4-wheel electronic air suspension in 2012 for the first time among the domestic players. “Based on our new world-class electric chassis technology, we are planning to improve the safety of autonomous driving systems by applying our own sensors such as radar, lidar and camera to them,” said Kim Se-il, Sr. Vice President of Hyundai Mobis Chassis & Trim.